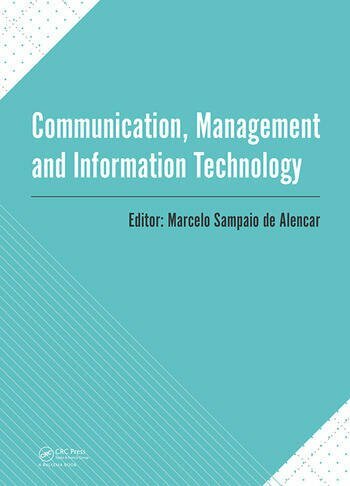 Communication, Management and Information Technology contains the contributions presented at the International Conference on Communication, Management and Information Technology (ICCMIT 2016, Cosenza, Italy, 26-29 April 2016, organized by the Universal Society of Applied Research (USAR). The book aims at researchers, scientists, engineers, and scholar students interested or involved in Computer Science and Systems, Communication, and Management. Marcelo Sampaio de Alencar was born in Serrita, Brazil in 1957. He received his Bachelor Degree in Electrical Engineering from Universidade Federal de Pernambuco (UFPE), Brazil, 1980, his Master Degree from Universidade Federal da Paraiba (UFPB), Brazil, 1988 and his Ph.D. from University of Waterloo, Canada, 1994. For the past 18 years he has worked for the Department of Electrical Engineering, Federal University of Paraiba, where he is Full Professor and supervised more than 60 graduate and several undergraduate students. He published over 400 engineering and scientific papers and 19 books. Marcelo is Chair Professor at the Department of Electrical Engineering, Federal University of Campina Grande since 2003. Previously, he worked for the State University of Santa Catarina (UDESC). He spent some time working for Embratel and University of Toronto as Visiting Professor. He is founder and President of the Institute for Advanced Studies in Communications (Iecom), founder and vice-president of the Academy of Sciences of Paraiba, and IEEE Senior Member. Marcelo is a columnist for the traditional Brazilian newspaper Jornal do Commercio since 2000.